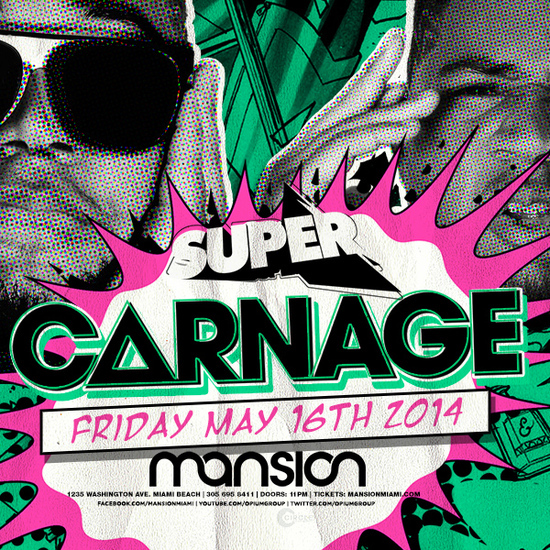 Attend The Crowd Party w/ Carnage @ Mansion , 10:00 PM - 05:00 AM on Fri, May 16 2014 @ DREAM HOTEL - HIGH BAR , Miami Beach, FL, United States MIAMI BEACH PARTY CROWD'S ALL NIGHT DANCE PARTY 1 TICKET. 3 PARTIES. 10 PM - 5 AM. ANOTHER NIGHT ON SOUTH BEACH! This South Beach Party lineup... Pre-Party @ HIGH BAR Dance Party @ Mansion After-Party @ WHITELAW HOTEL BAR PARTY LIKE A ROCKSTAR, ON A FIXED BUDGET! Party in style, stretch limo rides between party venues. NO WAITING IN LINE, ANYWHERE. SEMI-OPEN BAR @ Pre-Party Table/Bottle Service @ Dance Party SEMI-OPEN BAR @ After Party Learn more about Crowd Parties > This South Beach Party experience... The Pre Party, from 10 PM - 12 AM, is where it all starts! You meet, mix and mingle with the Crowd. Drink and even dine, you know, for all the drinking and dancing ahead in the night! We designed our Pre Party to allow you to socialize and easily find friends with whom you have real chemistry. AND WE BREAK THE ICE. With a mix of innovative social games, and personal one-on-one introductions by our friendly hosts and hostesses, you will never have more fun meeting and making new friends. The Pre Party plugs you into the Crowd, and gets you REALLY ready to party like a ROCKSTAR. The Dance Party, from 12 AM - 3 AM is the main event. The Crowd heads to one of the Beach's premier dance nightclubs for the time of your life. Huge sounds, huge dance floors, huge crowd. NO mood-killing waiting lines, we deliver VIP entry to the hottest dance clubs on the Beach. Within the Crowd, you are a celebrity, and will party HARD with YOUR CROWD. The After Party, from 3 AM - 5 AM, is the perfect ending to your night out on the Beach. Hosted in a cozy, intimate lounge, you have a chance to sit down, catch your breath and cement new friendships made in the Crowd. It's a quiet place to share a nightcap, exchange digits, and of course, create your happy ending.... PRE-PARTY @ DANCE PARTY @ AFTER PARTY @ JOIN THE CROWD. GET YOUR PARTY PASS NOW!